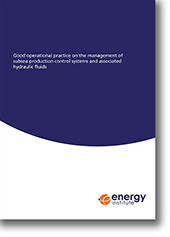 The guidelines in this publication apply specifically to subsea production control systems (SPCSs), both direct acting and electro-hydraulic, where pressurised hydraulic control fluid is distributed and controlled on the seabed to operate process valves and subsea isolation valves (SSIVs). The guidelines raise awareness of operational good practice of SPCSs and associated hydraulic fluids. By implementing good practice, operators of SPCSs can manage their anticipated hydraulic use and discharge and have systems in place to recognise and respond should abnormal conditions occur. offshore operations staff/control room operators. Although these guidelines are intended for use in UK Continental Shelf (UKCS) subsea fields, and make reference to the UKCS regulatory requirements set by the Department of Business Energy and Industry Strategy (BEIS), the principles described can equally be applied in other geographical locations. It should be noted that subsea control systems are diverse in their design, age and operation and consequently not all of the good practices in this publication will be technically feasible or cost-effective in every situation. The guidelines are intended to supplement the design requirements specified in ISO 13628 - Petroleum and Natural Gas Industries – design and operation of subsea production systems. This publication does not seek to replicate or replace existing industry standards covering the design of subsea control systems. The guidelines do not apply to the discharge or release of hydrocarbons from subsea production pipelines or equipment, nor are they intended to cover the integrity management of the non-hydraulic subsystems of the SPCS.